What is the Express Permitting Program? 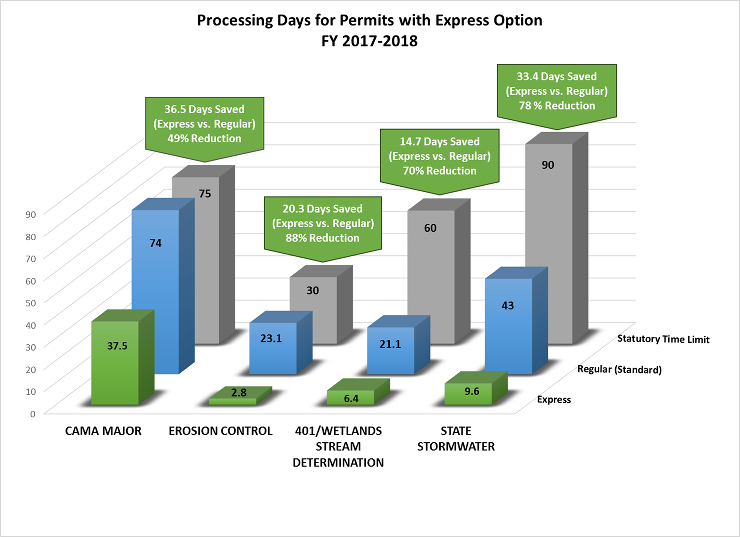 The Express Permitting Program offers a more timely review process for a number of environmental permits required for development. This program offers quicker permit decisions and certifications as well as consultation to identify necessary environmental requirements. Higher fees are charged to support additional staff for the express review. A pre-application meeting is required and a well-documented application with supporting technical information is necessary for a thorough and swift review. Multiple permits that may be required for a project may be reviewed concurrently. Coastal State Stormwater Permits (Division of Energy, Mineral and Land Resources) - Scroll down to "Express Permitting". Please note: The best way to identify which program applies and the proper jurisdiction to contact is to search for the development site on the Interactive Stormwater Permitting Map. Erosion and Sedimentation Control Plans (Division of Energy, Mineral and Land Resources) - Scroll down to "Express Permitting Option". CAMA Major Permit Statutory Time Limit Note: The Coastal Area Management Act allows the Division of Coastal Management 75 days from the date the field representative accepts the application as complete to take action on a major development permit. This period can be extended for an additional 75 days if more time is needed to review the proposed project. To schedule an Express Review contact an environmental assistance coordinator in your area.